Please consider getting involved and help continue to make Evergreen a wonderful community to live and raise a family. This you can do by attending our AGM. All board positions are open for nomination. If you would like more information please email info@myceca.ca. We have some directors that will be incumbents but all positions will be open for nominations and there are many vacancies. 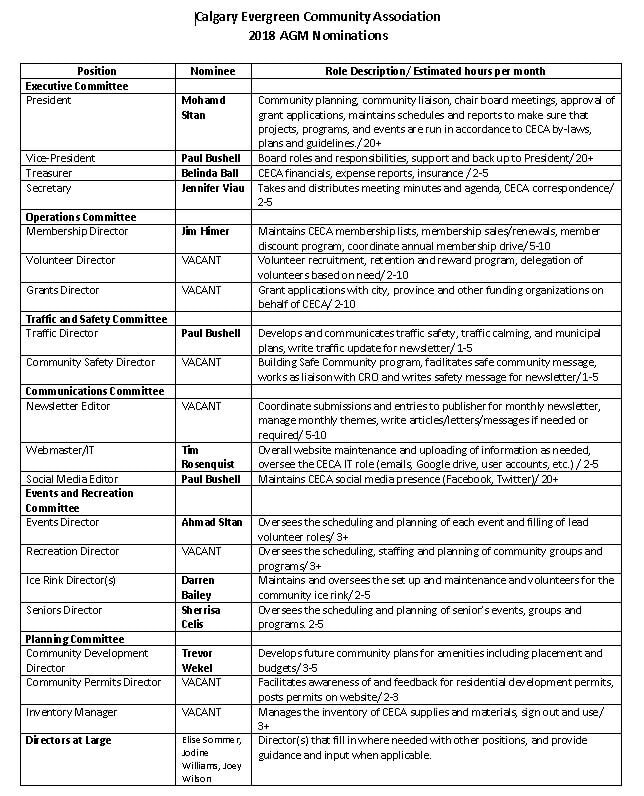 Director vacancies include: Events, Recreation, Grants, Sponsorship, Volunteer, Newsletter, Permits, Inventory, Website and Safety. Email info@myceca.ca if you want info on any position. 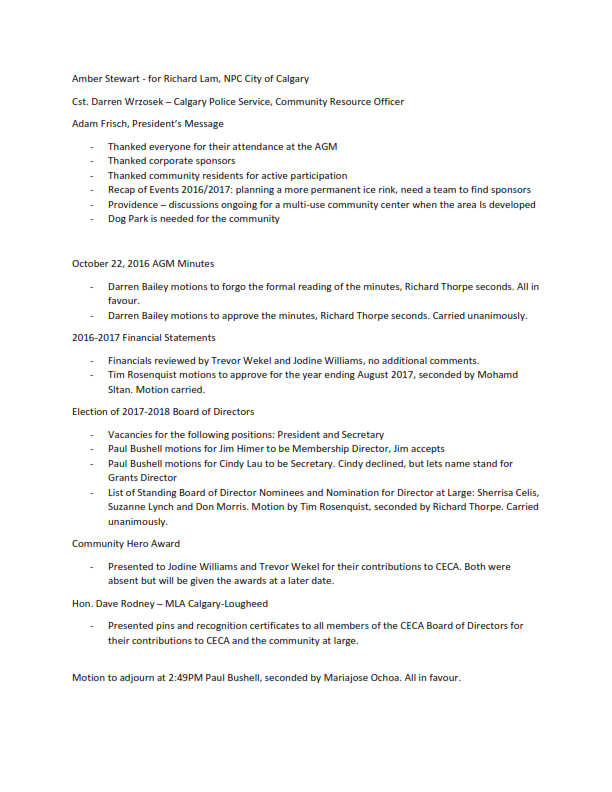 At the AGM we will need to pass motions on past minutes, the past years finances and elect the new board. 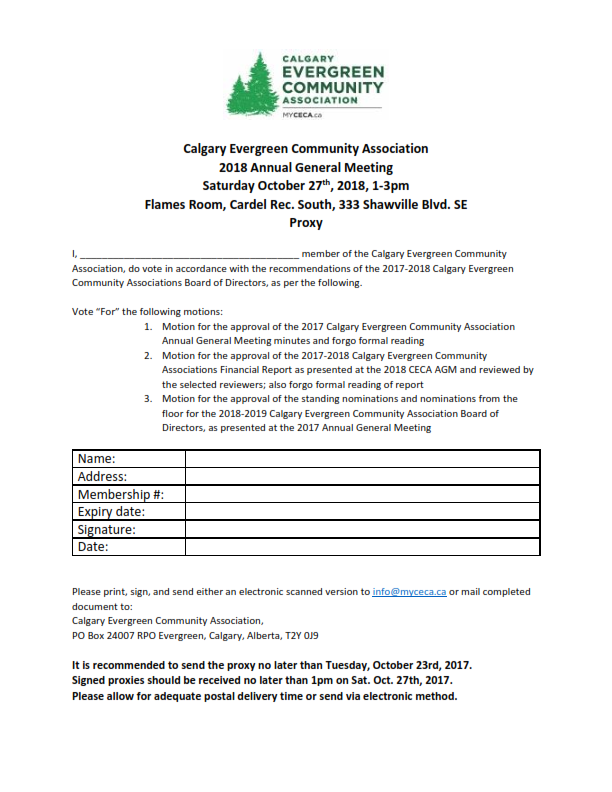 If CECA members are not able to attend, we need them to download the proxy form, fill out, and sign and send it in to us. The minutes from the 2017 AGM and the 2017-2018 financial statement will be uploaded and available for review. 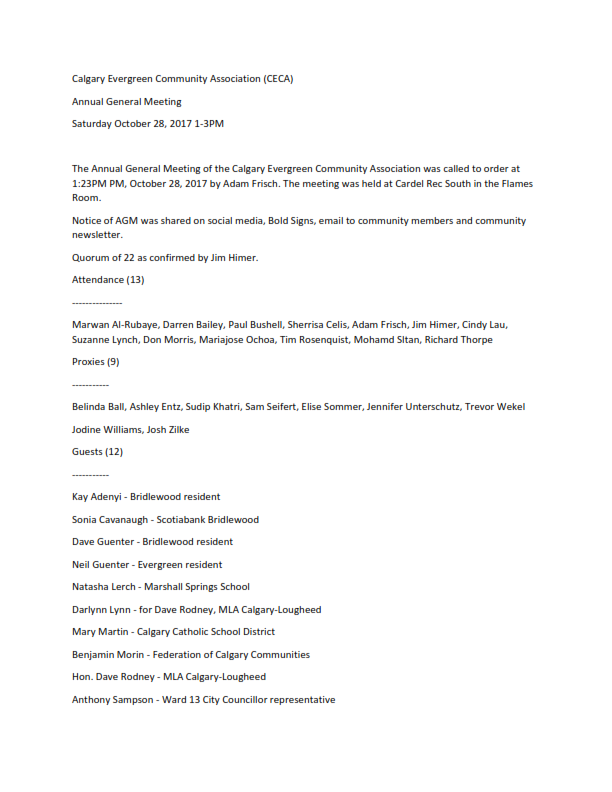 If you are not able to attend the AGM, we encourage you to download a proxy form, sign it and send it to us via electronic or snail mail. We need to receive the proxies by the latest, 1pm on the 27th. It is important to participate in the AGM in order to have a voice in the activities of the community but also that we advocate to the city on your behalf. We need a minimum of 20 attending members in good standing and/or proxies at the AGM to achieve quorum. It is imperative that we have a quorum and a good representation of the community as the wellbeing of the community association depends on it and in turn the such things like the ice rink, events and programs. 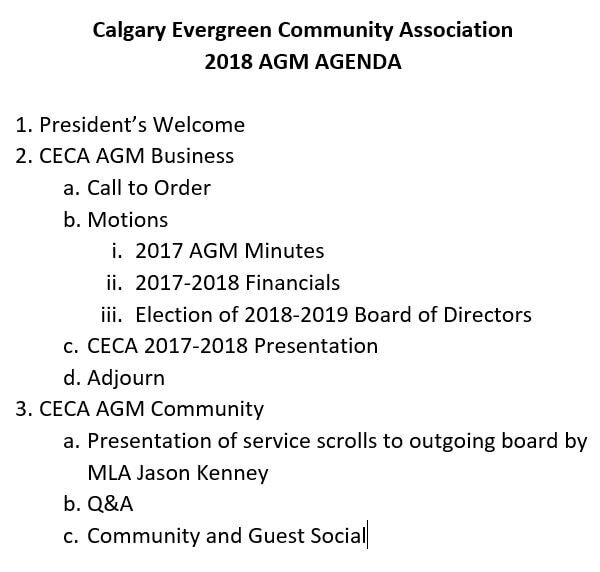 If you have any questions regarding the AGM, and what the Calgary Evergreen Community Association is or does, please email info@myceca.ca. Come out and get your questions answered in person. We also will be having a Q&A session and social after the business portion of the AGM. This is a good opportunity to find out what is planned for Evergreen and raise your concerns. At the social our guests will include Ward 13 City Councillor - Diane Colley-Urquhart, CPS Community Resource Officer - Darron Wrzosek, and Principal of Marshall Springs Middle School - Shawn O'Neill. This is not AGM for the Evergreen Residents Association. The ERA is the association that some residents pay $150 annual fee too. There is no membership number for the ERA. See the banner on our website to learn difference.